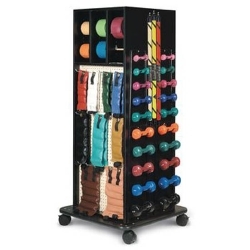 Accessorized Weight Rack Compact 1 to 10 lbs. Hugger® Weights: (1) each of 1 lb., 2 lb., 3 lb.,4 lb., and 5 lb. / Dumbells: 2 Each 1 to 10 lb. / Exercise Bars: (1) each 1 lb., 2 lbs., 3 lbs., 4 lbs, 5 lbs., "Soft-Ball" Weights: (1) each 1.1 lbs., 2.2 lbs., 3.3 lbs., 4.4 lbs, 5.5 lbs., and 6.6 lbs. Accessorized Weight Rack Mobile With Mirror Mega-Rack 1 to 10 lbs. 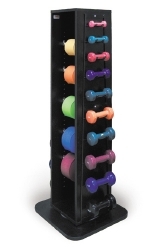 Accessorized Weight Rack Rotating Rack 1 to 10 lbs. 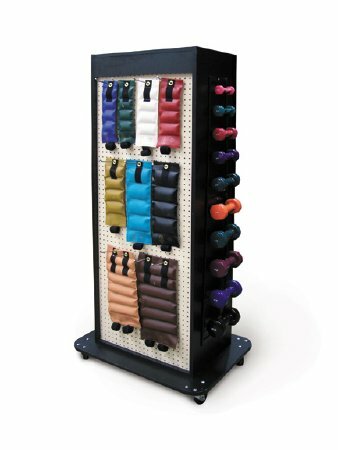 Accessorized Weight Rack Wall Mounted 1 to 10 lbs. Dumbells: (1) each 1 lb. through 10 lb. Accessorized Weight Rack 1 to 10 lbs. Weight 1 to 10 lbs.